Tonight on The Colbert Report, Marvel chief creative officer — and longtime writer/artist — Joe Quesada confirmed rumors that Cap’s longtime ally Sam Wilson, a.k.a. The Falcon, would be taking the adamantium shield from original Cap Steve Rogers. As of this fall, Captain America will be a man of color. Created in 1969, Wilson/Falcon was the first African-American superhero in mainstream comics, and has been a persistently important character in the Marvel universe. 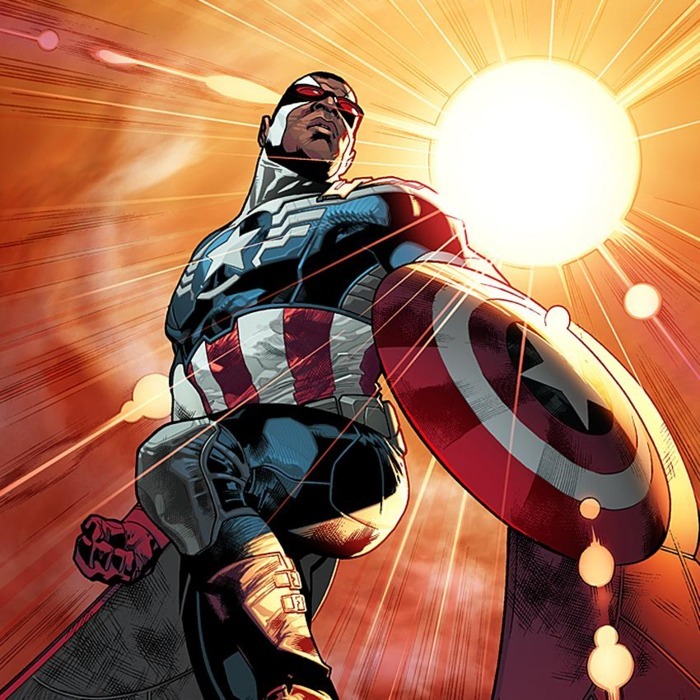 He first appeared in the pages of Captain America, and ever since, he’s been especially important in stories about the Star-Spangled Avenger — one need look no further than Falcon’s cinematic debut (as portrayed by Anthony Mackie) in this year’s box-office mega-hit Captain America: The Winter Soldier. The ins and outs of Steve Rogers’s abdication are a bit too complicated to bore you with here. But basically, he lost the power of his life-extending, power-giving Super-Soldier Serum and is rapidly aging. Marvel has said Rogers isn’t dying, but he’ll be taking a backseat and offering remote support to Wilson. While the soon-to-be-ex-Falcon will not be the first African-American to don the Captain’s shield — that distinction goes to the character Isaiah Bradley, introduced in the 2003 limited series Truth: Red, White, and Black — this high visibility passing of the shield, coming as it does shortly after the recent announcement of a female Thor, certainly appears to indicate a concerted effort on Marvel’s part to include more diverse faces within the top-tier superhero landscape. What’s next, a transgender Iron Man?